I am a Wellington based qualified interior designer specialising in kitchen and laundry design. When I completed my Diploma in Interior Design in 2003 I discovered I had a real passion for kitchen design. This led to a position as a designer in a kitchen showroom for a few years, then later to a joinery factory in a design and marketing role. At that time, I was a busy Mum with 3 children living in Lower Hutt. 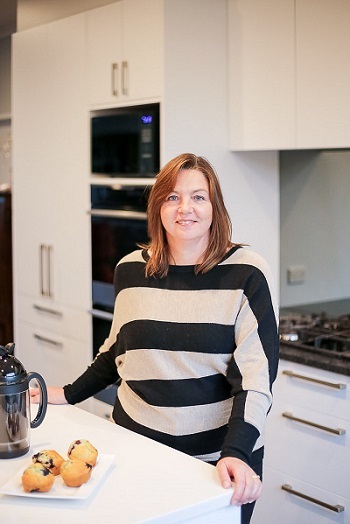 Over the years, my passion for helping people and strong desire to offer individual customer service and a truly personal experience, inspired me to get started as an independent kitchen designer. So in 2015, after much encouragement from my partner, I packed up and went over the hill to Whitby to live with him and set about starting my own business! We are now married and have 5 children between us, a beautiful grand-daughter, and a very spoilt dog who thinks he is a human. I know first-hand just how busy life can be, and the importance of a stylish and functional kitchen with room for all the family. If you are ready to update your kitchen, but don’t know where to start, you need me! I take the time to come to your home, get to know you, look at your space, and talk through the options. The initial consultation takes about 2 hours and includes a site measure and a comprehensive question and answer session. This is a time for me to take a full brief from you so that I can best understand how your kitchen should function for you and your family. Following the initial consultation I will contact you again to discuss the design process, answer any questions and confirm the design pricing structure. My clients say they like the personal, individual attention I offer and the close working relationships we make. It’s all about building trust.